HIALEAH, Fla. – The Florida National University Women’s tennis teams beat College of Saint Mary 9-0 Thursday, March 21st at Goodlet Park Tennis complex. FNU’s Sofia Pera and Candela Bonivardi took down CSM’s Christina Ternent & Katie Golka in the first pairing of doubles by a score of 8-2. FNU’s Moana de Souza and Ana Barreto defeated CSM’s Allyak Rayyan & Marissa Newman in the second doubles matchup 7-4. 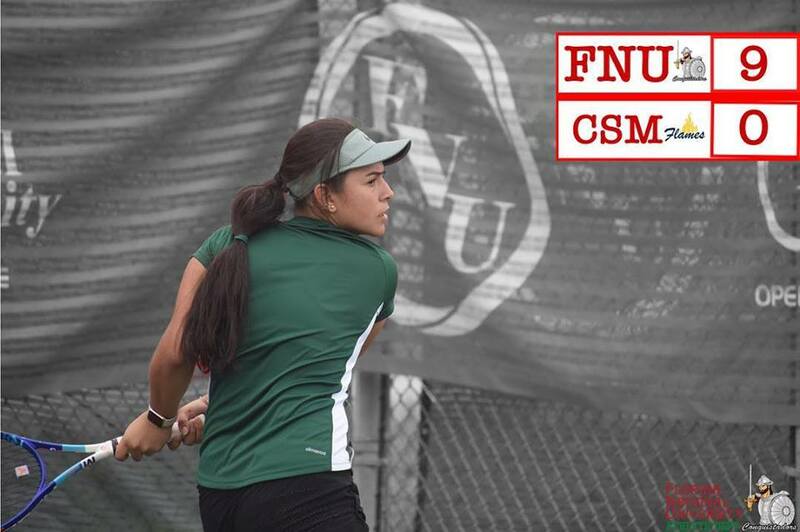 FNU’s Andrea Guzman & Nathalia Vivas finished things off in the third doubles slot defeating CSM’s Carly Bindl & Regi Zakrzewski 6-4. Candela Bonivardi (FNU) defeated Christina Ternent (CSM) 6-0, 6-2. Sofia Pera (FNU) defeated Katie Golka (CSM) 6-3, 6-2. Nathalia Vivas (FNU) defeated Allyak Rayyan (CSM) 6-4, 6-1. Moana de Souza (FNU) defeated Marissa Newman (CSM) 3-6, 6-3, 10-8. Andrea Guzman (FNU) defeated Carly Bindl (CSM) defeated 6-1,6-2. Ana Barreto (FNU) defeated Regi Zakrzewski (CSM) 6-3, 6-2. The lady Conquistadors will face Saint Thomas University on Thursday, April 11th, at Saint Thomas University at 4:00 p.m on the last game of the season.